I'm Brith, and the icon you just clicked was my Uncle Rennie. Brith is a Welsh name, and it means spotted. 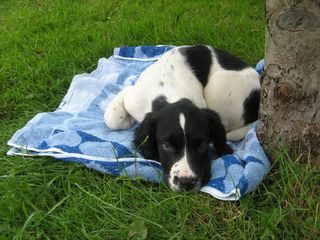 My pets decided that I should have a Welsh name as I come from Wales - from a small village near Denbigh called Prion. You might have heard of Bara Brith, yes spotty bread! 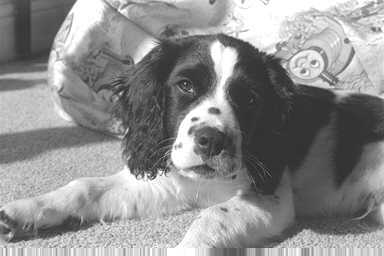 I am actually an English Springer Spaniel, and my proper name is Magical Teal. As you can see, I have grown a bit since the picture on the right was taken, and I still love my Thomas the Tank Engine bean bag - even though it has been taken over nowadays by my new pal Gwion. He's a real card, climbing right on top and snuggling down so that he almost disappears. 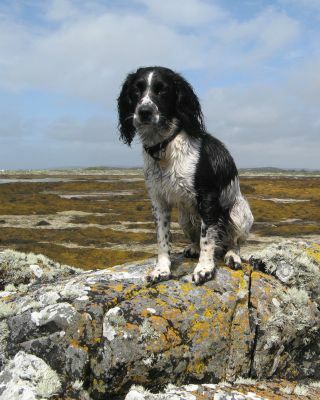 My hobbies are wildlife, bird-watching, collecting old sheep-bones, eating, walking and resting. I get lots of email asking how I put this page together. The answer is that I have a special keyboard with very large keys so that I can press them one-at-a-time with my paw. It's very difficult for me, and I am still waiting for Bill Gates to come up with some barking-recognition software. I also have trouble with the mouse. It won't move properly, and it's always got its tail tied onto the computer. I have to wait until my pets leave the picture CD in the computer drive, because they would get cross if I picked it up in my teeth. You know how it is with pets. I have relatives living nearby in Deganwy! My clever mother had another litter, and I sometimes meet my half-brother and half-sister when I go out to the beach for a walk. They look just like me. What fun! 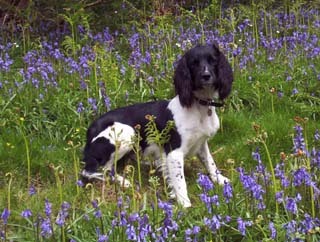 Magical Teal, W2340105W02, English Springer Spaniel, Black/White, Dog. Breeder: Mr T. Evans of Prion. Born: 2nd May 1996. Sire: Ambrosius Arthur, S1631408S02, Liver/White. Dam: Smile of Jess, U0153402U01, Black/White. Tegid came to Deganwy in the Summer of 2017, no relation this time but still with an impeccable Denbighshire background, raised on a farm near Rhug, Corwen. 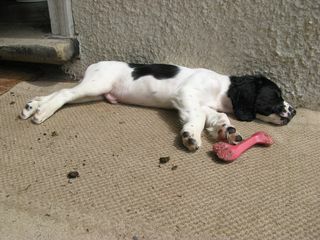 He is a brilliant young chap and settled-in nicely after less than a week. He has taken up the classic pose on the mat on the front porch, and is making occasional leaps onto the Thomas bean-bag when he thinks Madog is not looking. The boss was very keen that he should have a shortened tail, and the little flag on the end is beginning to show nicely. His ball-skills are improving quickly, and the collection of heirloom toys is proving to be most acceptable. Tegid took his first train journey behind a classic Hunslet quarry locomotive on the Rheilffordd Llyn Tegid (Bala Lake Railway) at their gala on August Bank Holiday, and hasn't looked back since, what with trips around and even his first holiday in the Brecon Beacons in October. Amazingly, Tegid is no longer the baby of our local pack, but gained a new playmate in November, Hazel who is a Welsh Springer Spaniel. Tegid is another of the famous names of Welsh legend in the Mabinogion, and it is especially appropriate as he was raised at Gwerclas, not far from Llyn Tegid. Tegid was the husband of the enchantress Ceridwen, whose servant was Gwion Bach. 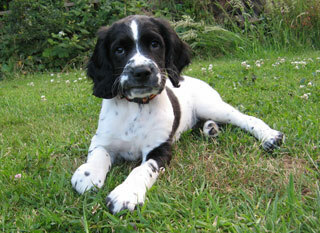 English Springer Spaniel, Black/White, Dog. 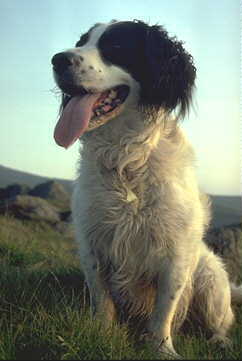 Breeder: Mr S Tudor, Gwerclas, Corwen. Born: 9th April 2017. Sire: Tyddyn Farm Charmer (Caleb), AExxxxxx, Liver/White. Taking up the pose on the porch mat. 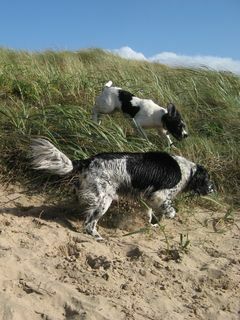 Playing in the dunes at Porth Trecastell, Anglesey. 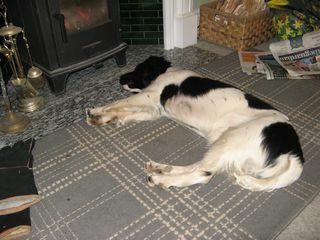 Tegid learns the secret of stoves. Madog was the new baby back in 2009. He was tremendous fun, ever ready for a game and grew fast. He was always finding some new trick to play on us all..... This week it is finding new ways to the lawn from the back door - including death-defying leaps from piles of soil or pushing through long grass and ambushing Gwion. We couldn't wait for him to have his jab, so he would use up some energy exploring a bit further afield. He took well to riding in the car, and the Boss said he is the only puppy they have ever had who was not sick straight away. Took Gwion ages, but a trip to the Isle of Skye sorted him out! Funny thing was, as time went by Madog's travel sickness became much worse and he was only happy in the car when in his bed. A small price to pay for an outing, though..... And stranger still, after Gwion's passing he was never sick in the car! Madog is named after the (legendary) son of Owain Gwynedd who is reputed to have sailed away from Llandrillo to explore the Western Ocean and discovered America in the 12th century. 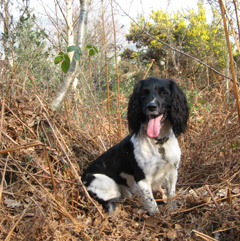 Breeder: Mrs J. Buckley-Jones of Rhewl, nr Denbigh. Born: 30th April 2009. Sire: Monkey Business (Trigger), AE02184206, Black/White. Playing in the garden at about 12 months old. On holiday in Connemara, and loving the water. Madog will honestly swim lengths up and down the beach! 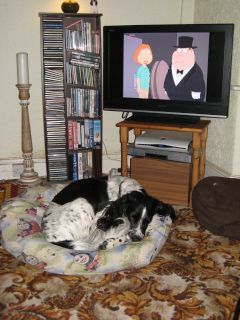 Madog's favourite television programme is Family Guy - just like the Boss. 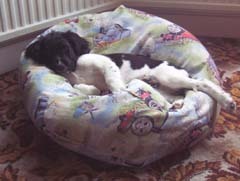 And look who has bagged the bean-bag! That has seen some good dog-time since it was bought for the children. GWION This is the story of my pal Gwion. He was only young in these first pictures, but learning fast. I taught him about all about rabbit holes when we went for walks together round Deganwy Castle and the Vardre. He is very friendly, but will insist on muscling-in when I am sitting on my mat on the porch, and that makes me go to find another place to sit. 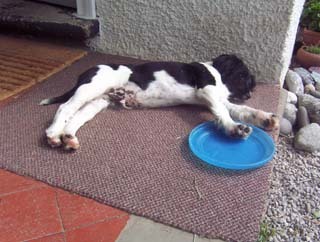 He loved to play at Frisbee with me, but soon became tired. Nowadays he is always rushing about after his toys, and hardly seems to worry much about rabbits. He plays silly games and pretends to lose his ball - except that sometimes he really DOES lose it and then the boss gets cross with him. I don't take much notice because he whizzes around too fast for me these days, but he's great company. Gwion is named after a character from the old folk tale of Tegid and Ceridwen. Do you remember? The serving boy who became wise by accident - quite a fitting name if you think about it. Sadly, Gwion is no longer with us after passing away in 2016. Breeder: Mr W. Bates of Rhewl, nr Denbigh. Born: 16th April 2004. Sire: Edwardiana Tango, Z2633302Z03, Liver/White. The picture above was taken on the Vardre in Deganwy in the Spring when Gwion was two years old. Here is Gwion playing in the woods at Cae Coch near Dolgarrog, one of the Boss's favourite walks, and ours too, of course. 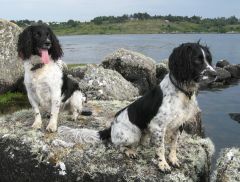 Gwion and Madog on holiday in Rosmuc, convinced that a rock in the water is a seal coming to spy on them. RENNIE This is a picture of Rennie. He was panting because he had just dragged the boss to the top of Tal-y-Fan to see the sunset. Luckily, it is only a 700 foot climb from the end of the road and he was able to keep up! Rennie is no longer with us, but he taught me a lot about life with my new pets, and all about their boat when we went on holiday together. He took his name from Sir John Rennie, the famous canal engineer, who built the Grand Union Canal. Rennie spent a lot of time on their boat, and was always the first off to work locks - even if it meant falling in. Sticks were always abundant, sometimes he would even drag whole branches out of the hedge to play with - and usually ended up whacking someone around the knees with them! 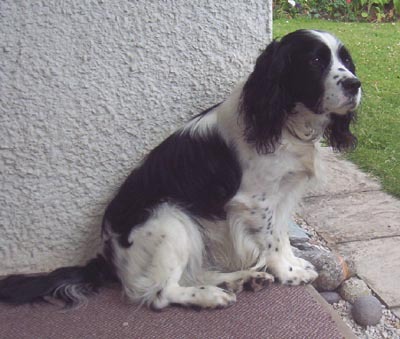 Breeder: Mr P. Miller of Sandy, Beds. Born: 6th June 1984. 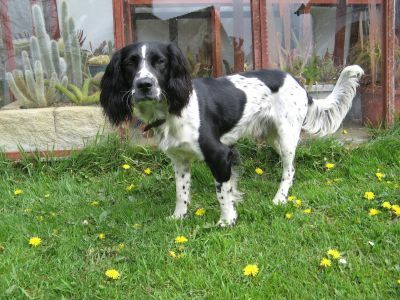 Sire: Jake of Pinehawk, B1422604E09, Liver/White.